Originally found in Mexico, it's name comes from the Greek word meaning 'ordered universe' for how balanced the simple blooms appear. 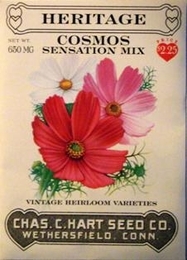 These early flowering cosmos became all the rage in the early 1920's when all the older varieties didn't bloom until fall. A summer blooming annual for sunny locations. Mixes well in a wildflower meadow. Airy blossoms come in all shades of deep pink to white. Cosmos grow 2 to 3 feet tall and makes a nice cut flower. Sow seed indoors 4 weeks before last frost or sow seeds directly outdoors in late spring. Cover seeds with 1/8 inch of fine soil. Adapts well to poor dry conditions once established.